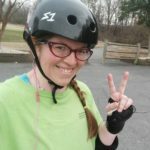 Show your support for the Charlotte Roller Girls and consider wearing purple this St. Patrick’s Day, rather than green. You can have a derby filled day when you join the Charlotte Roller Girls in the AM for the Charlotte St. Patrick’s Day Parade. The parade starts at 11 am at Tryon and 9th and ends at Tryon and 3rd. Later, you can head over to the Grady Cole Center later in the evening to catch up with the girls at the first home bout of the 2012 season. In the first game of this double header event, the B-Dazzlers will be facing off against Greensboro’s Camel City Thrashers. The All-Stars are taking on the Tallahassee Rollergirls Capital Punishment in the second bout. Both teams are gaining steam after tough losses in Charleston, SC. The B-Dazzlers have never faced off against Camel City, but the off the track rivalry has already begun. This is sure to be a thrilling game when nearby teams go toe-to-toe. 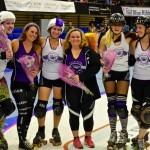 The Charlotte Roller Girls All-Stars have previously faced off against Capital Punishment, in May of last year. They lost a hard-fought away game, and will have the home field advantage this go-round. 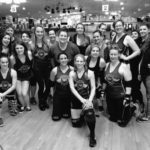 But Tallahassee have demonstrated they will be a formidable opponent, after recently pulling off an upset win over Green Country Roller Girls of Oklahoma. Halftime entertainment will be provided by local band Evelynn Rose. Season tickets are on sale now, and can be purchased online. Single game tickets can be purchased from the Common Market (either location), the Sleepy Poet Antiques Mall, or from your favorite Charlotte Roller Girl! Tickets are $10 adult/$6 child in advance and $14 adult/$8 child on the day of. This bout is sure to be a popular one, so get your tickets early to be assured a seat! Doors open at 4:30 pm, B-Dazzlers bout starts at 5:00 pm. Grady Cole Center is located at 310 N. Kings Drive. Access to the official after-party, located at the Mellow Mushroom 2820 Selwyn Ave Ste. 100 is included with the purchase of every adult ticket.